October for me is the start of Autumn, as we're officially out of September and the weather really starts to get colder and crisp around this time of year. Now I never used to be an Autumn kind of gal and to a degree i'm still not but I have learnt to embrace what Autumn and also Winter brings, and I do look forward to the change of season, as it brings a fresh approach to many things in my life. Instead of doing a typical 'to do list' style post as mine never seem to go down that well, I thought i'd share some things i'd recommend doing through October which involves a few things I too will be doing, and some ways in which you can also embrace this change of season and what it brings. Get into the Halloween spirit - Halloween was probably my favourite holiday after Christmas when I was growing up, as i'd love to dress up and go trick or treating with my cousins. Now that i'm older trick or treating isn't really something a 24 year old can do, so instead i'm embracing and getting in the Halloween spirit in other ways, such as - Watching Halloween movies (Hocus Pocus, Harry Potter etc..), planning Halloween blog content, picking pumpkins and adding some Halloween decor to my room. Bake - If you saw my 3 Easy To Bake Halloween Cookies post last year, then you'll know how much fun I had baking these tasty treats! One thing I really enjoy doing in Autumn is baking, as it allows you to enjoy yourself with making an endeavour out in to the cold, and when you've got Halloween coming up it makes for a perfect excuse to whip up some tasty treats! 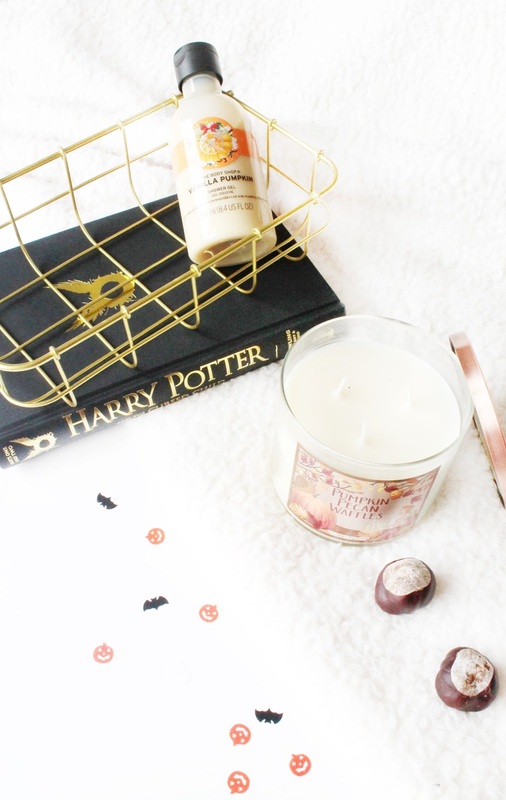 Buy all of the pumpkin scents - It seems during October everywhere goes crazy for pumpkin products including shower gels, candles and even drinks, and although i'm not the biggest fan of pumpkin, I do like some of the scents that companies bring out. This year i've already picked up a few candles, including the B&BW Pumpkin Pecan Waffle Candle ($22.50) which you can purchase through shipping companies such as MyMallBox or GoSend. I also saw a few people posting about The Body Shop Vanilla Pumpkin range and I just had to see what it was like, and low and behold I ended up purchasing the Vanilla Pumpkin Shower Gel (£5). As I love vanilla scents, this mixed with the pumpkin smells absolutely incredible and I can't wait to start using this! What things do you have planned this month?